The Louisiana State University Health Sciences Center at Shreveport (LSUHSC-S) includes the University Hospital, Schools of Medicine, Graduate Studies and Allied Health Professions, the Biomedical Research Institute, the E.A. Conway Medical Center in Monroe, and the Huey P. Long Medical Center in Pineville. Their distinctive histories overlap in many respects and together form the Health Sciences Center. The history of the University Hospital dates back to 1876 when the Shreveport Charity Hospital was established at Pierre Avenue and Ford Street. Thirteen years later in 1889, the Hospital was relocated to a fouracre parcel of land at the corner of Texas Avenue and Murphy Street in downtown Shreveport. A new and larger facility was constructed on the same site in 1904. The Hospital’s final move was in 1953, to a 23-acre plot on the southeast corner of Kings Highway and Linwood Avenue. Since funding for the new building came from the Confederate Veterans’ pension fund, the hospital received a new name - Confederate Memorial Medical Center. The LSU School of Medicine in Shreveport was authorized in 1965 by an act of the Louisiana Legislature. One year later, the Legislature authorized $10 million in bonds, matched by $20 million in federal funding, to initiate establishment and construction of the Medical School. The first class of 32 medical students was enrolled in 1969, with classes held at the nearby Veterans Administration Hospital. The first Doctor of Medicine (M.D.) degrees were awarded in 1973. The Medical School’s permanent buildings were completed in 1975, immediately adjacent and connected to the Confederate Memorial Medical Center. Beginning with the 1976 freshman class, first-year enrollment was increased to approximately 100 students. The School of Graduate Studies in Shreveport was also established in 1965 as part of the LSU Medical Center in New Orleans. Ph.D. and M.S. degrees were offered in the five basic science departments of Anatomy, Biochemistry and Molecular Biology, Microbiology and Immunology, Pharmacology and Therapeutics, and Physiology and Biophysics. Although graduate students were able to take courses in Shreveport since the 1965 affiliation, it was not until 1974 when the first class of graduate students was accepted at the Shreveport campus. The first Ph.D. candidate graduated in 1978. The School of Allied Health Professions in Shreveport was established in 1977 as a branch of the New Orleans campus. Cardiopulmonary Science, Speech Language Pathology, and Medical Technology were the three programs initially offered by the School. A group of 11 allied health students constituted the first graduating class in 1980. The Children’s Center, a service unit of the School of Allied Health Professions, opened in April 1981 with the mission of assisting special needs children to achieve their fullest developmental, educational, and health potential. Over the next seventeen years, degree programs were added in Physical Therapy, Occupational Therapy, and Physician Assistant. The School has now grown to an annual enrollment of over 300 students. In 2008, personnel moved into a new state-of-the-art facility on the south side of the campus. The State Legislature authorized the transfer of the Confederate Memorial Medical Center from the State Charity Hospital System to the LSU System in 1976. Two years later, the name of the hospital was changed to the Louisiana State University Hospital to reflect its new status. By 1978, the Shreveport campus consisted of the LSU Hospital, the School of Medicine, the School of Graduate Studies, and the School of Allied Health Professions and was collectively known as the Louisiana State University Medical Center at Shreveport. In 1999, the institutional name was changed to the Louisiana State University Health Sciences Center at Shreveport. In 1994, The Biomedical Research Institute was constructed on the campus of the LSU Medical Center. This building was funded by the Biomedical Research Foundation of Northwest Louisiana and houses state-of-the-art laboratories that are utilized by LSU researchers. From their inception, the academic components of the Health Sciences Center in Shreveport were under the administrative control of the Chancellor of the LSU Medical Center in New Orleans. With local support, an independent Chancellor for the Shreveport campus was appointed on November 3, 2000. In 2004, the School of Graduate Studies and the School of Allied Health Professions gained administrative separation from New Orleans and were placed under the leadership of the Shreveport Chancellor. At the same time, Deans were appointed for the two Schools on the Shreveport campus. 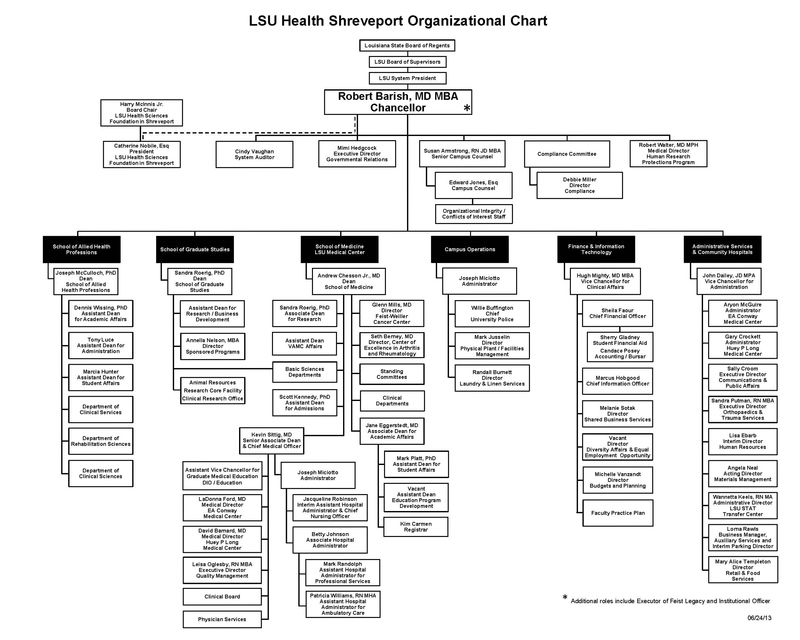 On July 1, 2005, the LSUHSC at Shreveport was legislatively authorized as a separate entity. In June 2009, separate accreditation was received from the Southern Accreditation for Colleges and Schools for the academic programs. The last two components of the Health Sciences Center were added in 2003 and 2007 respectively, with the legislative transfer of the E.A. Conway Medical Center and the Huey P. Long Medical Center to LSUHSCS. In 2009, the positions of Chancellor and Dean of the School of Medicine were separated. Today, the LSU Health Sciences Center at Shreveport continues to grow while maintaining its dedication to patient care, education, research, and public service. Educating physicians, basic scientists, residents, fellows, and allied health professionals based on state-of-the-art curricula, methods, and facilities, preparing students for careers in health care service, teaching or research.